Tatamibari is a logic puzzle designed by Nikoli. Every partition must contain exactly one symbol in it. A + symbol must be contained in a square. A | symbol must be contained in a rectangle with a greater height than width. A - symbol must be contained in a rectangle with a greater width than height. 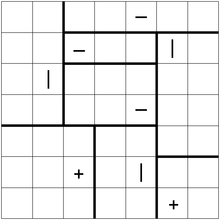 Solve the given Tatamibari puzzle. 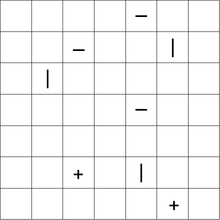 The input is a 2D grid that represents the given Tatamibari puzzle. Each cell contains one of the four characters: +, -, |, and a character of your choice to represent a non-clue cell. In the test cases, an asterisk * is used. If a puzzle has multiple solutions, you can output any number (one or more) of its valid solutions. The input is guaranteed to have at least one solution. Standard code-golf rules apply. The shortest code in bytes wins. Input is list of lines, ~ for non-clue. Outputs a single solution to stderr in the format (x_start, width, y_start, height). Try it online! This is too inefficient for the suggested test cases. # and add each new partition to the list of partitions. Not the answer you're looking for? Browse other questions tagged code-golf grid puzzle-solver or ask your own question.